FINIS Zoomers Fins are short blade sprint swim fins that promotes a faster, more propulsive kick. Their fit and style make them easy do do flip turns with. Please understand, Zoomers are made for increasing leg strength and adding cardio intensity to swim workouts. They are best used in interval training, although United States Navy SEALs use them in distance swimming also. Zoomer swim fins are NOT for snorkeling. * Zoomers run smaller than your shoes. * I purchased the next size up. * The open edges can cause blisters. * I coat edges with a smear of Vasaline. * Zoomers are heavy. Be aware. * Do NOT go hard initially. * Your feet may cramp at first. * You may notice a little ankle soreness. 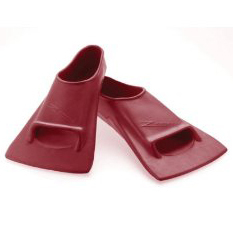 Zoomer swim fins are excellent for interval training and speed drills. I do not use them with a kickboard because I like going faster. You know if an elite fighting unit like the United States Navy SEALs uses Zoomers as an integral part of their extensive and demanding conditioning, there is something very beneficial about them.